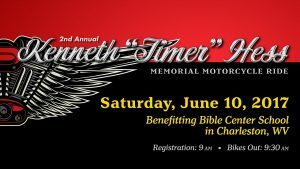 BCS is pleased to host the 2nd Annual Kenneth “Timer” Hess Memorial Motorcycle Ride—along with the Bible Center Bikers—on Saturday, June 10, 2017. This event will be celebrated by both motorcyclists who participate in this ride and by the community. An opening ceremony featuring the local VFW post will begin at 9:45 AM to pay respectful tribute to Kenneth “Timer” Hess. He was part of the Greatest Generation and was a World War II Army veteran with the 95th Infantry Division, known as the “Iron men of Metz,” which was the highest French decoration for the liberation of France and Europe during WW II. All contributions will go toward providing scholarships for BCS students. For more information, contact Principal Bacchus. Sign up to donate supplies or to volunteer on the 10th.